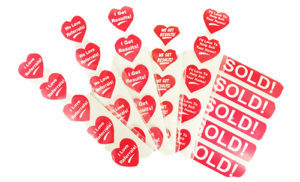 Check Out These New Items in the Realty Shoppe! NEW items in the Shoppe! 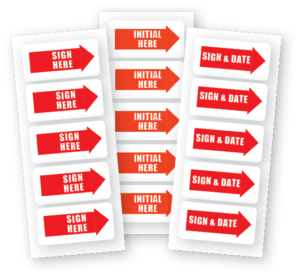 Can be coordinated with the multi-colour Please leave your business card/Please take a moment to register and reversible Welcome sign to add a professional flow in your marketing products. 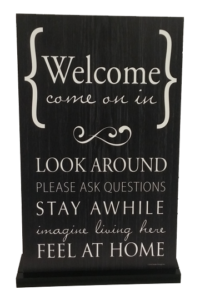 Greet your clients in style with this creative Welcome sign! 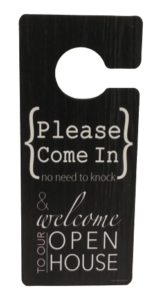 Can be coordinated with the wood grain reversible Welcome sign, Please leave your business card/Please take a moment to register display sign and feature sheet stand. Stands on a table, or can be hung from a wall. Note: All applicable taxes are extra. 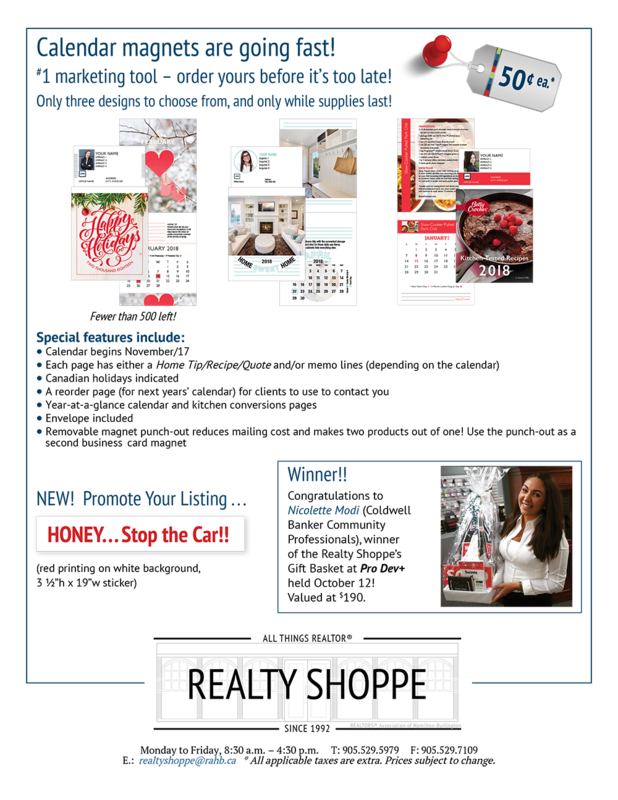 Check out these great features from the Realty Shoppe! Price REDUCED by 15% only until Friday, June 29! 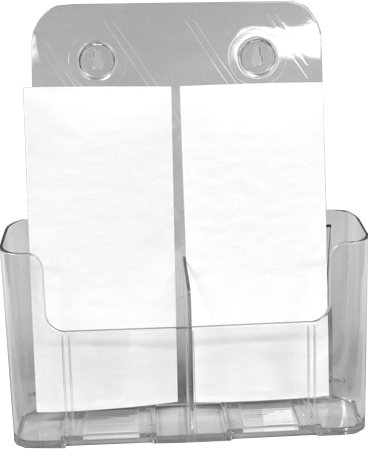 Multi-Use Feature Sheet Stand – NEW REDUCED PRICE! 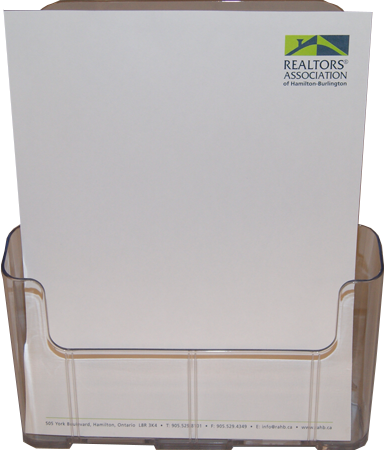 Holds 8” x 11” sheets or can be adapted with the removable divider (included) to create two pamphlet pockets. 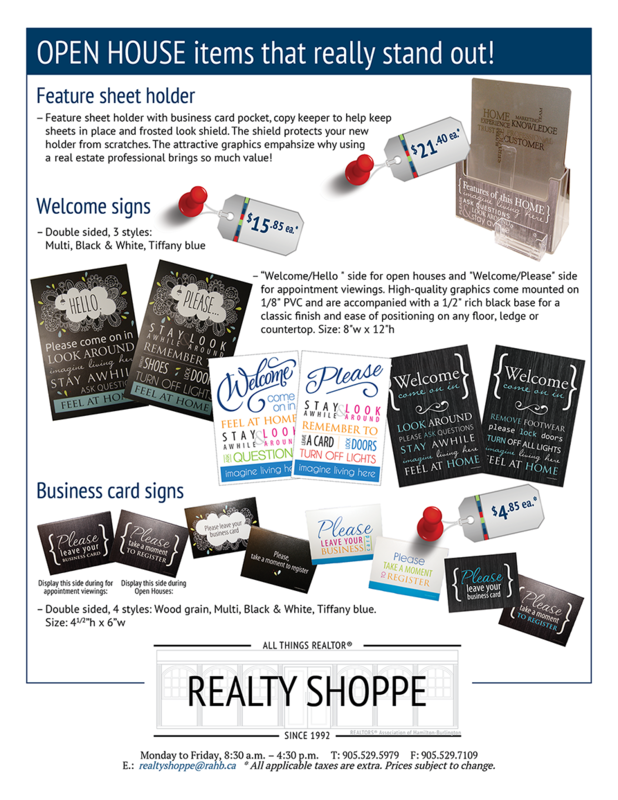 Check out these great Realty Shoppe features! 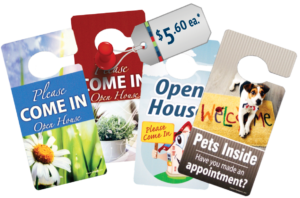 Bring attention to important messages you would like your customers to see! * All applicable taxes are extra. Prices subject to change. 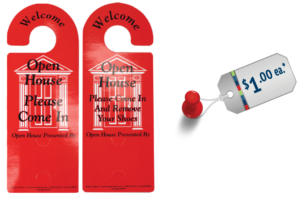 RAHB’s Realty Shoppe is filled with tools to help you promote your services to current and future clients! Notepads now restocked – get yours today! I’d Love To Help Sell Your Home! 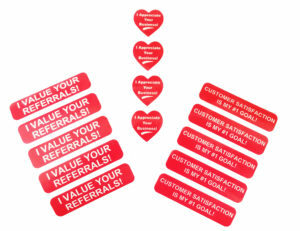 CUSTOMER SATISFACTION IS MY #1 GOAL! 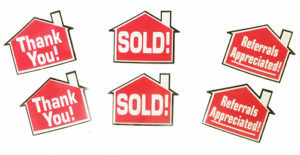 E.: realtyshoppe@rahb.ca * All applicable taxes are extra. Prices subject to change. 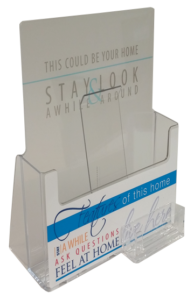 Have you seen the new metal sign frames at the Realty Shoppe? 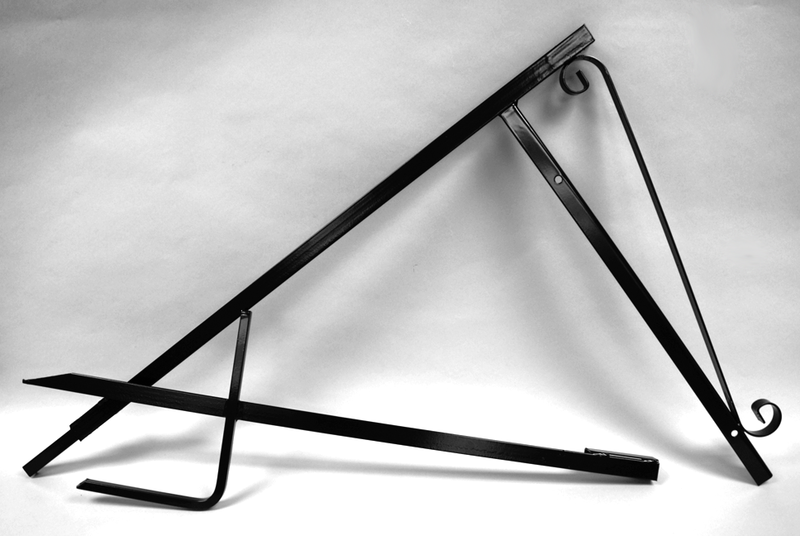 They are Colonial “L” style (2 pieces), black in colour, and measure 25” w x 72” h (11” shank w/stabilizer bar). 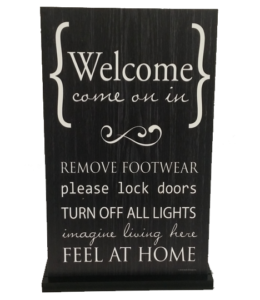 These metal frames are perfect for hanging 24-inch wide signs! Only $36.75 each at the Realty Shoppe. Contact Wanda at realtyshoppe@rahb.ca to order yours today! Member Appreciation Day: Congratulations to Our Two Winners! 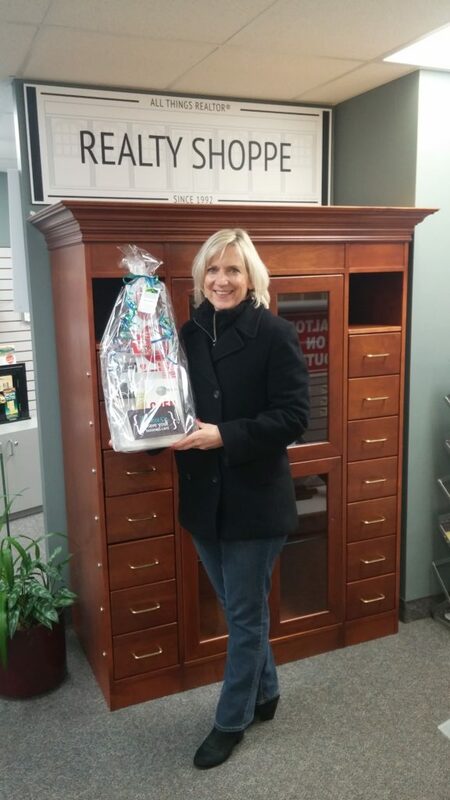 Light refreshments and giveaways were enjoyed by all who dropped by the Realty Shoppe on January 15, 2018 to join in the celebration. 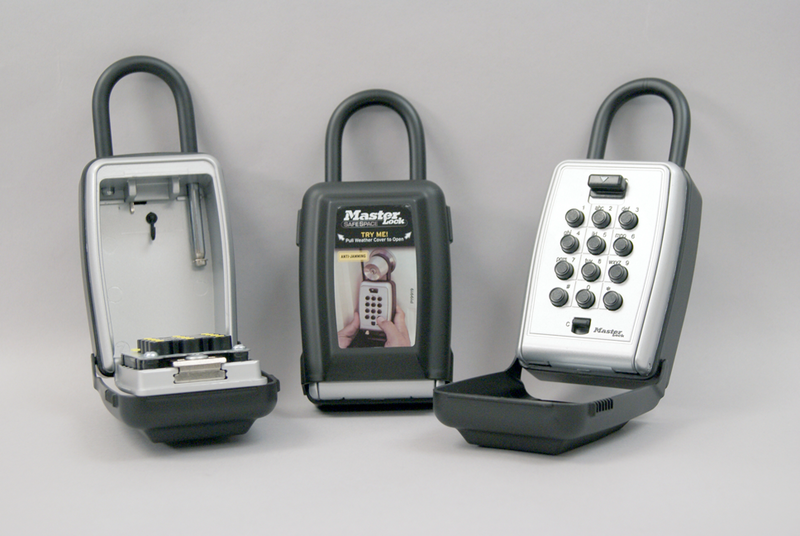 Available at the Realty Shoppe: Master Lock lockboxes, with weather covers to protect from rain and snow! Remember to use your lockboxes properly! 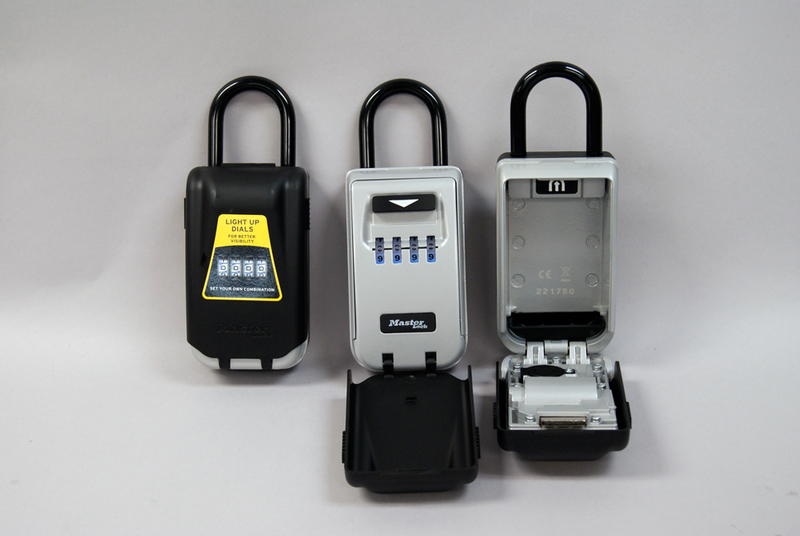 Lockboxes are an important tool for your business – be sure to use them properly. When leaving a location where you have used the lockbox, ensure the lockbox is actually locked again. For a dial lockbox, this means spinning the dial once it is shut, and for the pushbutton style, re-keying the number combination to close it. Never give out a combination to someone who is not known to you to be a salesperson, particularly when you receive a request for the combination via cell phone. If you are uncertain, call the salesperson back at their office for confirmation. 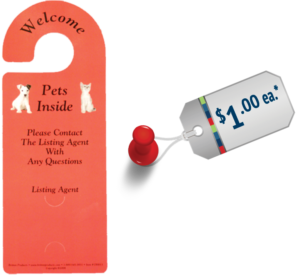 Members shall ensure that lock boxes installed on each of their listings are set with a unique code for the security of their Seller’s property. 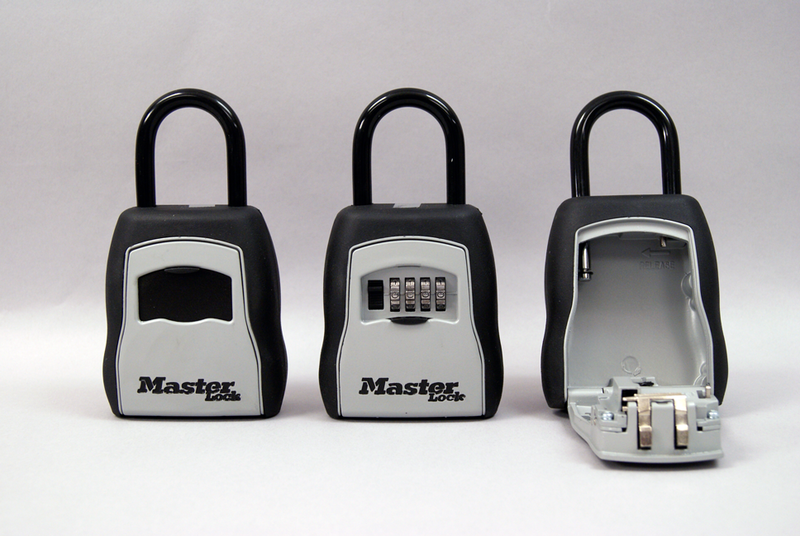 Further, members shall change the lock box combinations, as required during the course of the listing to maintain reasonable security, and not use any preset manufacturer’s code. 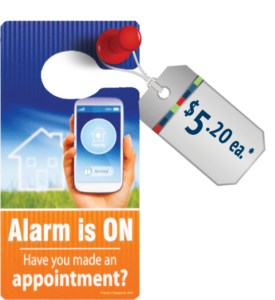 Any member found to be in breach of Rules and Regulations, Section 2 – MLS® Listings sub-section 2.17 (lock box code) will be fined $50 for the first offence, and $200 for the second and any subsequent offence. 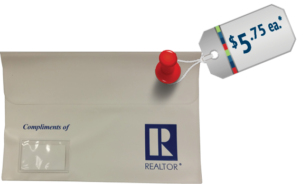 Member Appreciation One-Day Sale at the Realty Shoppe! 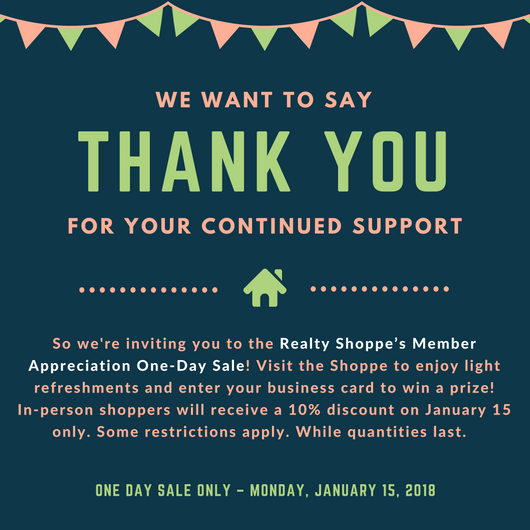 To THANK YOU for your continued support, we are inviting you to the Realty Shoppe’s Member Appreciation One-Day Sale on Monday, January 15, 2018! Visit the Shoppe to enjoy light refreshments and enter your business card to win one of two great prizes. In-person shoppers will receive a 10% discount on January 15 only; some restrictions apply and only while quantities last. Please contact the Realty Shoppe (905.529.5979) for details. Please note that the Realty Shoppe will be closed all day Friday, December 15, 2017 for inventory – sorry, no sales or orders. We apologize for any inconvenience this may cause. We will be open again for full service on Monday, December 18, 2017. The Realty Shoppe will be closed for inventory on Friday, December 15 – no sales or orders. We apologize for any inconvenience – your cooperation is greatly appreciated! Chili Cook-off Flash Sale at the Realty Shoppe! On Thursday, November 23, 2017 only, the Realty Shoppe will be offering a 20% discount on the following Shoppe products, while quantities last. Discount will be applied to in-store purchases only – you must purchase in person, and personal shopping only please. Some restrictions will apply: please contact the Realty Shoppe (905-529-5979) for details. 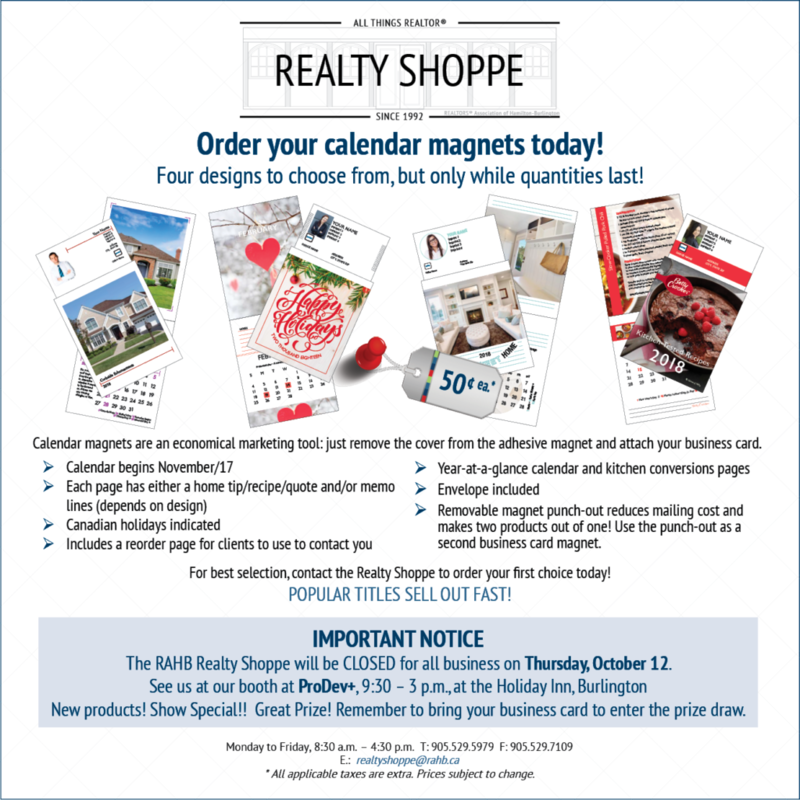 Realty Shoppe Calendar Magnets are going fast! 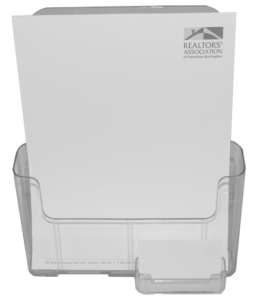 Calendar magnets are an economical marketing tool – just remove the cover from the adhesive magnet and attach your business card. The Realty Shoppe currently has four designs to choose from, but only while quantities last. To order yours today, contact the Shoppe at (905)-529-5979 or realtyshoppe@rahb.ca.